Stuart Weitzman (similar here and here) - I feel like a fem-bot when wearing these boots. The heel is just high enough that I can wear all day and not yearn for a foot amputation at the end. Dressy or causal - these boots mesh well with almost anything I wear. Yves Saint Laurent (or Saint Laurent Paris now - blah) (similar here) - Chic and sophisticated to the 10th power. 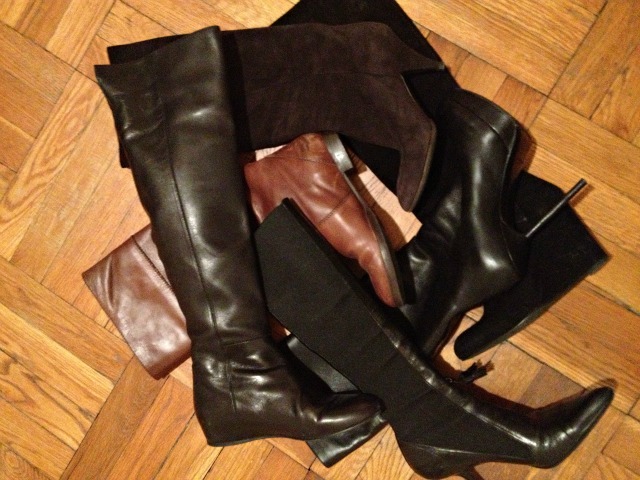 My favorite boots to wear with pencil skirts and polished, lady-like ensembles. Mildly comfortable - a cab is needed after walking for a few hours. Yves Saint Laurent (similar here) - Steam comes off of me when I wear these boots - that is how hot they are to wear. And these are the boots that get the boys' attention (married gals need attention too!) - sadly it's often for just a minute while I am desperately flagging down a cab, offering them my first born to pick me up because my feet are DYING. Stilt walking has nothing on me in these boots. Yves Saint Laurent (similar here) - Down a few inches in height, these pretties are easier to walk in and hug my calf with their built in Lycra panels. And that little tassel in the front makes me want to do a Rockette kick every time I wear them. Stuart Weitzman Flat Elf Boot (similar here) - If only the toe curled up slightly and had a bell........ But visions of Santa's helper aside, these are the perfect flat boot to wear for any occasion. Perfect with a fitted sweater dress or skinny jeans and a blouse - it's the all purpose boot. J. Crew Booker Boot - Much more casual and often my standard weekend boot. The leather is supple and soft so the shape tends to slouch just a tad - best worn over jeans or winter pants. Frye Lindsay Plate Boot - A recent purchase for me - these flat boots have a great equestrian look, which is perfect for living in......Montana. But since I reside in NYC, I am OK with being an equestrian poser. The leather is extremely stiff so it takes some time to break in (probably best done on the farm), but these are quickly becoming a favorite go-to boot for everyday, and when I ride my pony to work. Oh you thought I was going to show you my entire boot collection all at one time? Silly blog readers. I have been amassing a small boot collection over the years so there are multiple volumes to read in my boot series. Stay tuned for the exciting conclusion to the sleeper hit "A Boot Story" - due out early next week. It is sure to be a blockbuster hit. Pssstt....psstt....one last thing....I keep hearing around ALB headquarters that a giveaway is coming up soon, and it is supposedly a good one! So if I were you, I would keep all eyes and ears peeled for the news. Eek! So excited!